Have you ever had a plant that could take weeks of abuse and still give you its best? Well, Maranta leuconeura var. erythroneura (aka prayer plant or herringbone plant) is not one of them in my opinion. The prayer plant is so termed because of its characteristic leaf behaviour. During the day, it holds its leaves downwards or horizontally while at night it folds its leaves up and looks like it’s praying. These movements are called nastic movements. Here is a time-lapse video of the praying action. I once had a variation of Maranta leuconeura , kerchoveana and it appeared that most of its leaves lifted up much higher than erythroneura. This is purely my observation and after looking at different time lapse videos of both plants I’m beginning to think this might be the norm. Little is known about why Maranta and other similar plants move their leaves at night. A few theories have been proposed as Mark Lasbury of Biological Exceptions nicely explains, that this plant behaviour allows the plant to direct rain or dew drops down the stem to the roots of the plants. This keeps the rain from collecting on them and promoting fungal or bacterial growth and also reduces the probability of chill or freezing. Finally, this action also allows the plant to conserve moisture at night when it is not performing photosynthesis. I purchased this plant some time in January this year. It is one of my favorite plants. It has beautiful deep green leaves and vibrant red lines running through. Such an elaborate design. As beautiful as this plant is I can’t help but call it Princess because it is very particular about its environment and can be fussy if you don’t give it what it wants. About 2 months ago I noticed that new leaves on the plant were smaller and paler than new leaves used to be when I first got them. Actually some of them started looking like its much plainer sister Maranta leuconeura var. kerchoveana. Compare the smaller of the two leaves in the picture to the right to its ‘sister’ on the left. Quite similar right? I deduced that the small pale leaves were due to poor light as it was sitting in a not so well-lit area of my living room. I know the colours on new growth turns into deeper colours with age, however these ones that developed under the low lighting conditions never did as they aged. Princess had one new growth of leaf not yet unfurled and so determined for it to open with the right colours, I moved it to a bright although cool room. Well guess what? For two days Princess refused to pray at night. Instead it vehemently tucked its leaves close to the pot. Two leaves suddenly in the span of those two days turned brownish-yellow and died. What was I going to do? I didn’t want to lose my favorite plant. Panic set in. For someone new at this plant thing, it can be quite frustrating when your plant is talking to you by the way it behaves but you have no idea what it is saying because you have not fully grasped the language ‘Plantish’ yet. At this point I thought perhaps the room was too cold and moved it to a much warmer well-lit area. Evening came and it raised its leaves only so slightly. I thought we were getting somewhere. But in the morning, she looked worse. Limp and leaves curled. Soil was bone dry. Ahah! Water it needs water!! Eureka… I have decoded it (In the distance I think I heard angels sing “aaaahhh”). I quickly took it to the sink and soaked the soil thoroughly with some H2O before returning it to its decorative pot. Within a few hours the leaves had uncurled and it was full of life again. Whew! Saved. So, it turns out this whole time, I was so worried about the effects of poor lighting on Princess, that I forgot to check if she needed watering. Oops!! Well now Princess has a new home. I re-potted her into a hanging basket after realising placing her on top of a glass vase to elevate her wouldn’t cut it any longer. My husband accidentally knocked off the glass vase she sat on. I knew then, it was time !!! I am happy to say Princess is hanging beautifully near a north facing window and ‘praying’ at night. Have any of you had similar experiences with the prayer plant? Any comments regarding my observation on the leaf lifting angle? Hi! I’m a plant lover, too! I was wondering why the person in the 2015 post said they keep this plant at a south facing window. If it constantly has spider mites, it’s because the plant is in an ill-fitting place and therefore can’t defend itself against the bugs. Choosing the correct spot for a plant is very important. I learned this the hard way with african violets and 3x thrip invasion. The answer: no south facing windows for plants from shady areas of the tropics. I tried moving my maranta close to a south-west window and it didn’t like it at all. It needs to be far away from the brightest areas, definitely not next to a south facing window. 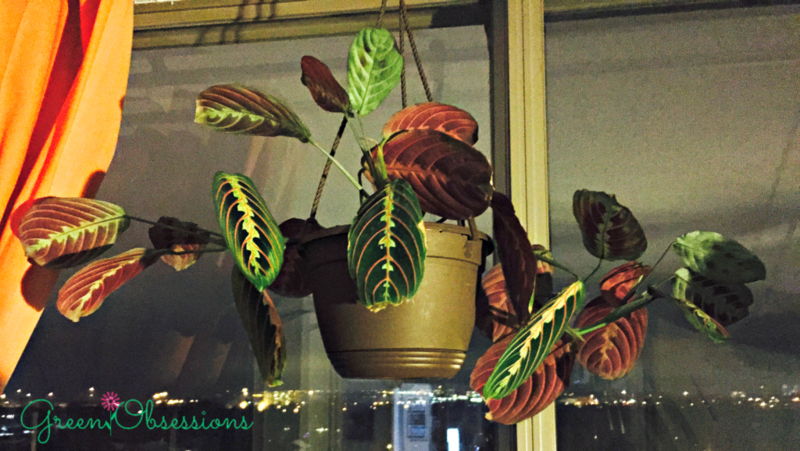 My prayer plant sits in a south facing window sill in my office kitchen. There are tall buildings in front so it gets direct sunlight for only 1-2 hours at a time. I don’t imagine the humidity is particularly high but I haven’t measured it with my hygrometer. For almost all of its life under my care, I’ve been at war with spider mites. Luckily, the spiders like to come out and nest right on the plastic hanger so I know the degree of infestation. I’ll give it a good spraying with insecticidal soap. Unfortunately, I think some eggs are deep in the folds on the stems. I’ve taken cuttings and rooted them successfully in water. Eventually, I will take enough cuttings to completely start over and hopefully eliminate the spider mites that way. Sorry to hear about your troubled prayer plant. Spider mites are very annoying. I had a battle with them for 2 weeks and finally gave up on the plant. It was an ivy. It is good you have cuttings to start over. All the best on starting your new plant. 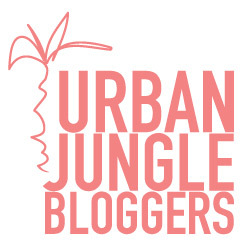 Green Obsessions » Blog Archive » It’s Getting Humid in Here: How I’m trying not to kill anymore ferns. I have this plant and love it! It grows new leaves all the time. I wish it will bloom soon. I would also like to take some cuttings to full up the pot but I’m too afraid and don’t know where to cut. Do you know? This is one of my favorite plants. Since I re-potted it in the hanging basket, the new leaves are bigger and full of colour again. I haven’t tried propagating this plant yet but gardeningknowhow. com (http://www.gardeningknowhow.com/houseplants/prayer-plant/maranta-prayer-plant-peacock-plant.html) has good instruction on how to do so. Let me know if you succeed and how you did it. All the best! Great article. I’ve been following this blog for a while now. The shoot of the praying plant hanging in the window is probably my favorite of them all! Thank you Jaquelyn. Glad you like my pictures. I will be adding more interesting articles so make sure to visit again!